Over the last year Android has seen some explosive growth with hundreds of new smart phones making their way to the market. However, we only get to see a unique device make its debut every once in a while. At CES 2011, Motorola announced the Atrix 4G which is the first smart phone to run on Nvidia’s Tegra 2 technology, the first to feature a laptop dock for desktop-like computing, and one of the first to run on AT&T’s new HSPA+ 4G network. After spending a few weeks with this device, I have had a fairly good experience aside from a few complaints. 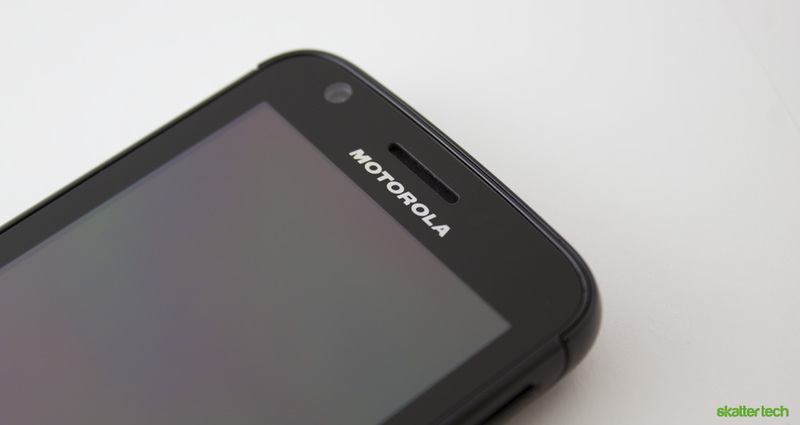 The Motorola Atrix packs a blazing fast 1 GHz dual-core Tegra 2 chip set, 1 GB of DDR2 RAM, and 16 GB of internal storage. There is also a microSD slot which allows for an additional 32 GB of storage expansion. This is all wrapped in a fairly small package, measuring just 2.5 inches wide, 4.63 inches long, and just 0.43 inches thick. The Atrix is not much larger than the iPhone 4, which is impressive considering the horsepower this device is packing. I also noticed that the phone becomes quite hot when performing processor-intensive tasks, a common problem with the latest smart phones which try to pack a lot in a small space. Dual-core processors will become increasingly popular as more devices begin utilizing them. Having two cores does not mean twice the speed, but increased multitasking capabilities allowing users to perform tasks quicker. In addition, contrary to popular belief, having two processors is actually better on battery life. This is because it can scale to use a single core or both cores as necessary. Motorola devices are known for their robust build quality and the Atrix lives up to this reputation feeling almost as tough as the Droid X. Although the almost entirely plastic body is fairly strong, I would have preferred a more robust metal build such as the one on the Nokia E7. I found the device attracting many smudges after only a few days of use which is a bit disappointing for such a high-end device. Like most Android phones, there are four touch sensitive buttons: menu, home, back and search. Surrounding the earpiece at the top are the front-facing camera as well as the light and proximity sensors. 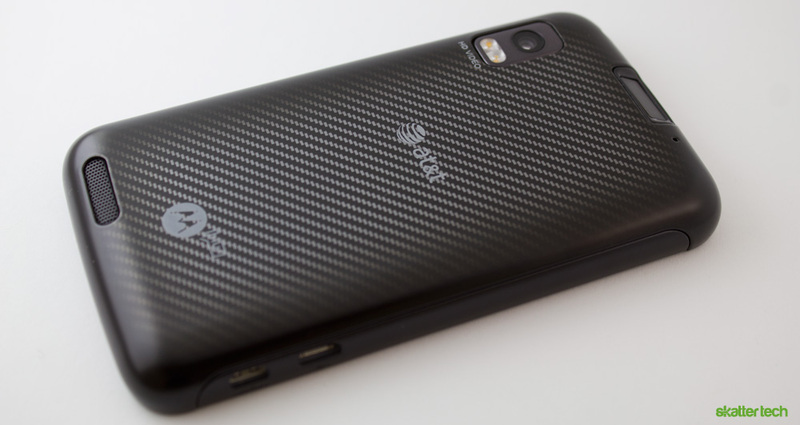 The back of the device features the speaker and a 5 megapixel camera sporting dual LED flash. The top only has the 3.5 mm headphone jack, while there is a volume rocker on the right side of the device and the left features ports for micro USB and HDMI. Removing the back plate requires some awkward finger placement and reveals an extremely high-capacity 1930 mAh battery, a microSD reader, and a SIM card slot. The power button, which doubles as the fingerprint reader, is on the top of the phone and I took a few days to get used to the awkward placement. I had to grip the phone very tightly in fear that it would slip out of my hands when trying to press the button since it is slightly recessed into the back of the device. The fingerprint reader is a neat concept, but it gets a bit frustrating to use since it occasionally fails to recognizing a fingerprint. As annoying as that can get, I still find it a useful tool for logging in without having to look at the phone. As a long-time Apple iPhone 3GS user, I was glad to switch over to the qHD resolution on the Motorola Atrix. The 4 inch screen sports a 960-by-540 pixel resolution, which brings it quite close to the 960-by-640 pixel resolution of the Apple iPhone 4. I noticed the ambient light sensor is a bit slower to respond to changes in light, but realized that this is actually a good thing. It ensures that the surrounding light levels are not fleeting, which helps conserve even more power. The higher resolution of the qHD display makes everything on the phone look very sharp. This will likely be the next standard for Android smart phones which generally featured 800-by-480 pixel resolution displays last year. Recently, HTC announced that the EVO 3D will also be running a qHD display, improving the likely hood of the resolution becoming standard. 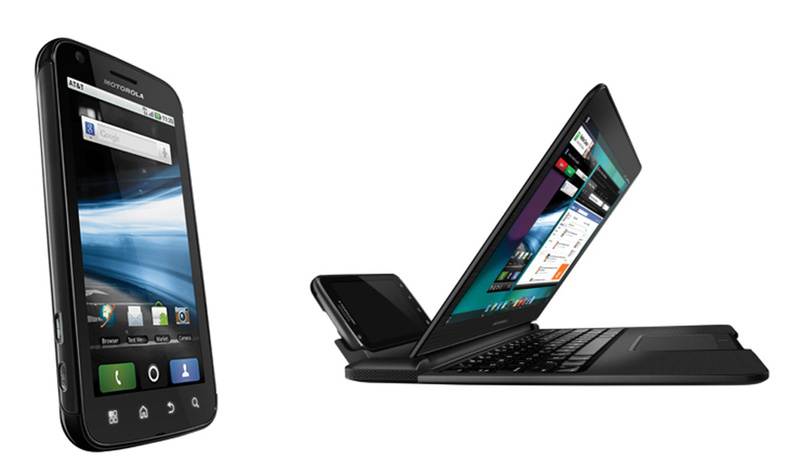 The Motorola Atrix 4G comes with Android 2.2 (Froyo) preinstalled with an update to Android 2.3 (Gingerbread) coming soon. Perhaps the most unfortunate aspect of the device is that Motorola decided to bring back its custom interface: MotoBlur. The UI seems outdated compared to others such as HTC Sense and even has drawbacks from the stock OS. I was also quite upset to find that AT&T and Motorola decided to include a lot of bloatware on the device which are fairly difficult to remove. To top it off, AT&T locked down the device, preventing users from installing apps from unknown sources and even blocking out many apps from even appearing in the Android Marketplace. Users can easily circumvent all of AT&T’s restrictions by rooting the device. I should note that doing so could void your warranty, however, I believe that the benefits of rooting far outweigh the risks. I do not understand why AT&T felt it necessary to block installing applications from outside, let alone in the Market. So much for Android being open! There were also a few odd issues where the WiFi interferes with the data connection, blocking internet connectivity altogether. This was most common after I would leave the Atrix on overnight only to be left without data access in the morning. This meant that emails, Twitter, Facebook, and even the browser would not work. After calling Motorola Customer Support, to see if it was an issue with my device, the representative stated that company is aware of the issues with a solution coming soon. In the meantime users can manually toggle the WiFi off and on to temporarily solve the issue. 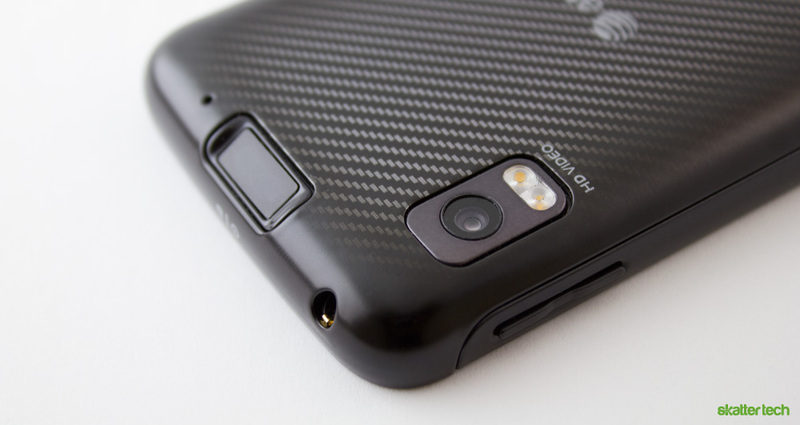 The 5 megapixel camera on the back takes some fairly high quality pictures. Most smart phone cameras have problems with low light but the incredibly bright dual LED flash mitigates much of it. I did notice that there is some graininess in low light situations, but it is hard to tell without zooming in. The back camera also doubles as a 720p HD camcorder. The video has a slight blue-ish tint to it, which makes everything look a little “cooler” than it should. Hopefully a problem that can be fixed through a software update. The front facing VGA camera is fairly mediocre, as one would expect. Since VGA is fairly outdated I would have liked to see a higher end 1.3 megapixel camera, similar to an iPhone 4 or EVO 4G. Regardless, the quality is decent and sufficient for quick video calls. While the Atrix still can not replace a standard point-and-shoot camera, it might for those who only take photos occasionally. Battery life is extremely important, as recent smart phones can barely make it through a single work day. While some may expect horrendous results with the Atrix due to the dual-core processor, my experience was just the opposite. Since Motorola included a 1930 mAh battery in the device, the largest capacity battery I have seen in a smart phone, I have been able to squeeze out more than 24 hours of battery life even with some fairly heavy usage. This is almost unheard of for a smart phone, let alone one this powerful. It is likely due to the combination of the intelligent scaling of Tegra2 and the large battery. Motorola has introduced a few accessories to give the Atrix even more functionality. I should state that I have not spent any time using either the laptop or HDTV dock. Regardless, they are noteworthy features of the device. The laptop dock is essentially just a screen, keyboard, trackpad, and battery. 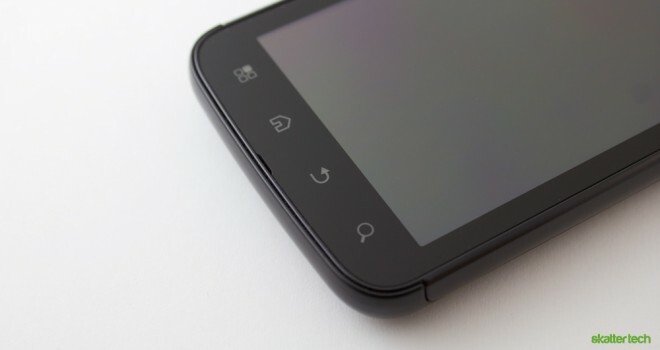 The brains of the device are all on the Atrix phone including the processor, RAM, storage, and network connectivity. The screen measures in at 11.5 inches and sports a 1366 x 768 resolution. The back of the dock also features two USB ports for data transfer. The dock has a black, brushed metal look and is slimmer than most other netbooks due to limited components on the inside. Without the phone docked in, the laptop accessory does nothing. However once connected, it offers access to a Webtop interface with a desktop interface featuring a full-fledged Firefox web browser. 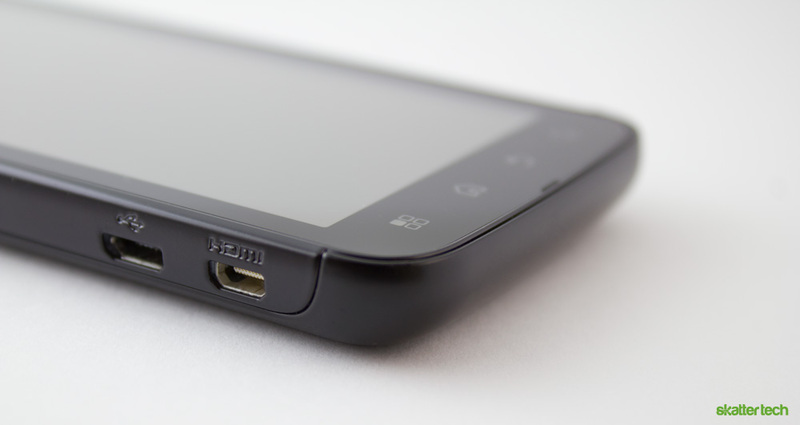 While paired together, the dock also powers the smart phone with a large battery pack for additional juice. In addition, users can access the phone’s storage through the web top interface. There is even a small virtual window to control and view the Android OS. Connecting the Atrix to the HDTV dock brings up a media center interface on your television. The interface allows users to browse through music, videos and photos on the device. The dock also sports two USB ports allowing users to connect additional media. Users will also get a remote to control the media center interface too. The HDTV dock seems to be slightly less useful than the laptop dock. While it does transform the Atrix into a set-top box, I do not think that this is something users want to do just yet. It might be an easy way to quickly show pictures to friends and family on a big screen, but I feel there are probably better ways of doing so such as DLNA. The laptop dock is quite pricey running users $500, while the HDTV dock costs $130. This is quite expensive, especially after spending $200 on the Atrix. The price reflects the fact that the docks are not yet a well-defined market and Motorola clearly does not want to loose a penny on the accessories. It would have been great to see a $200 laptop dock and a $50 HDTV dock, but I probably will not buy either at the current price. 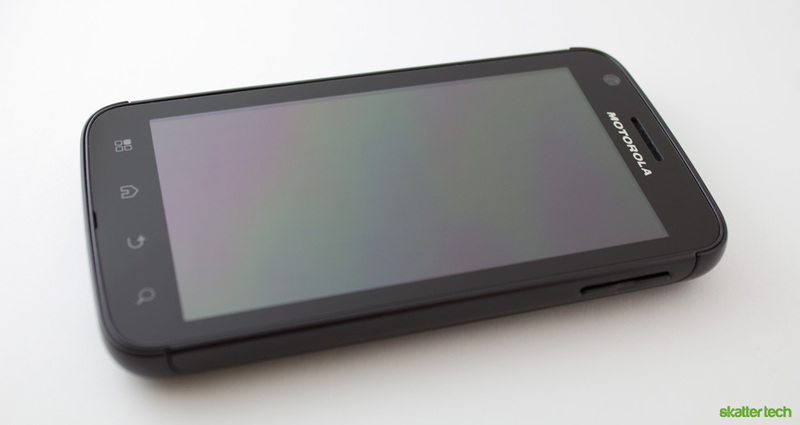 The Motorola Atrix 4G is one of the fastest smart phones currently on the market. I feel that there are a few things that are holding the Atrix back from exploding in popularity. First, the fact that AT&T has locked down app installations forces users to root their device to gain access non-Market apps. It is quite unfortunate that AT&T is restricting usage in this way. Secondly, the MotoBlur user interface is pretty frustrating, I would rather prefer the native Android 2.3. Although the highlight of the phone are the accessories, the device can definitely stand on its own. I would definitely recommend the Motorola Atrix 4G for any AT&T customer looking for a top-notch Android smart phone, even if you do not plan on sparing extra cash for the accessories. I love that this phone has a 5mp camera and the video quality looks soooo much better than any 8mp Android phone. Everyone bashed the iPhone 4 for having a 5mp camera, and all the EVO owners boasted about their 8mp shooter on the back. When you compare an EVO video to an iPhone 4 video, its night and day. Motorola did a good job on the camera. I got this phone about 3months ago and it is the only phone I have had that looses charge in one day. I fully charge the phone and put the alarm on to wake me up. I get one call or make one call and the phone is dead. Will never get a motorola again. Hopeless. Worst thing is I’m stuck with it for 24 months.